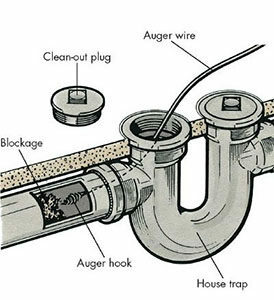 A clogged drain is one of the most common plumbing problems, and it is one that most homeowners will have to deal with from time to time. Even the best plumbing systems develop clogs, and your best efforts to prevent them don’t always work. Whether you are dealing with a stopped up shower, a clogged and overflowing toilet or a backed up kitchen sink, Lightfoot Mechanical can help. We offer professional drain cleaning in Fort Worth and the surrounding areas, and we can get things flowing again in now time. When you have a clogged drain, you may be tempted to reach for a chemical drain cleaner. They’re cheap, available just about everywhere and promise to eliminate even the most stubborn clogs. Have you ever stopped to think about how they really work, though? These products contain caustic chemicals that eat through clogs. Those chemicals can also cause serious damage to your pipes, and they’re extremely dangerous when they come in contact with your skin. Their fumes are also toxic. Is it really worth exposing your home and family to these dangerous chemicals just to avoid a visit from a professional Fort Worth drain cleaning service? At Lightfoot Mechanical, we have the equipment to bust up any clog quickly and without damaging your pipes. We never use products that endanger your family’s health and safety, and we guarantee that we can eliminate even the most stubborn clogs. Clogged drains are frustrating, but they are no match for our state-of-the-art equipment. When you call us, we will assess the situation to determine the location of the clog then get to work breaking it up as quickly as possible. Whether you have a complete blockage or a drain that is just flowing slower than usual, contact us today for expert drain cleaning in Fort Worth. Give us a call now at 817-596-0309 to schedule an appointment.